Gather your warmest thoughts of heartfelt happiness through this magnificent fresh from the farm bouquet of exquisite roses. 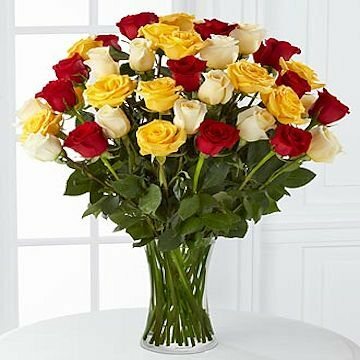 Hand gathered at select floral farms and bringing together bright yellow, brilliant red and velvety cream roses combine to create a spectacular display, this fresh flower bouquet is presented with a superior clear glass vase to make this a gift that comes straight from your heart. This gift includes the following: 12 stems of premium 24-inch yellow roses, 12 stems of premium 24-inch red roses, 12 stems of premium 24-inch cream roses and a superior clear glass vase. Stands approximately 26-inches in height. *50cm Roses are reduced to be proportionate to the vase, providing a good customer experience.